This is a very easy way to perfectly clean your car tires so that they look better than new. Mitch Rabovsky of M.R. Car Care generously shares his tricks of the trade for Lifestylevideos’ viewers. Watch this easy DIY method that consists of household and hardware store goods. Keeping your car clean is easy with M.R. Car Care. With over 20 years experience in the Car Detailing profession, Mitch Rabovsky takes pride in servicing your vehicle specifically to your individual needs as well as on a corporate level. Washing is done by hand and every effort is made to go above and beyond expectations including pick up and delivery at no extra cost. To find out more about Mitch and M.R. Car Care, visit his Facebook page at MR Car Care Ltd.
Watch as Mitch Rabovsky, founder of M.R. 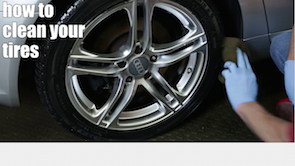 Car Care shows you how to clean your rims and shares the best way to remove wheel rim grime your self. To find out how you can have your car detailed by Toronto’s best by emailing Mitch directly at [email protected].